Jennifer Homans is a historian and critic who was also a professional dancer: She brings to Apollo’s Angels a knowledge of dance born of dedicated practice. She traces the evolution of technique, choreography, and performance in clean, clear prose, drawing readers into the intricacies of the art with vivid descriptions of dances and the artists who made them. Her admiration and love for the ballet shines through on every page. Apollo’s Angels is an authoritative work, written with a grace and elegance befitting its subject. Jennifer Homans was a professional dancer trained at the North Carolina School of the Arts, American Ballet Theatre, and The School of American Ballet. She performed with the Chicago Lyric Opera Ballet, the San Francisco Ballet, and Pacific Northwest Ballet. Currently the dance critic for "The New Republic," she has written for "The New York Times," the "International Herald Tribune, ""The New York Review of Books, " and "The Australian." She earned her B.A. at Columbia University and her Ph.D. in modern European history at New York University, where she is a Distinguished Scholar in Residence. "It has never been done before, what Jennifer Homans has done in Apollo’s Angels. She has written the only truly definitive history of the most impossibly fantastic art form, ballet….Homans accomplishment is akin to setting the most delicate and beautiful of all the imperial Faberge eggs into a fissure high on Mount Rushmore and tracking its unlikely survival…Inspired…The story of Balanchine has been told before, and at greater lengths, but never better…An eloquent and lasting elegy to an unlasting art." "A tour de force…the publication of Apollo’s Angels is itself a moment in the magnificent history of classical dance." "Magisterial… Apollo’s Angels is a cultural history of the highest order…Homans brings to the page a practical knowledge gained in an earlier career as a dancer. Thus she leaps easily from big picture political trends in one sentence to the minutiae of a dancer’s steps in the next, from how dances were made to who the patrons were…Fascinating reading." "Here is a book of immense ambition—a one volume history of ballet—and of considerable accomplishment….Homans shows herself to be both dogged and graceful as a historian—a rare and welcome combination of qualities…I follow her gratefully through the centuries as she traces the progress of ballet from its beginnings…Her deft intelligence and lively voice keep the book from sounding too academic, and its vast stock of information is cogently organized." "It’s hard to believe that a book like Jennifer Homans’s Apollo’s Angels, on a topic of such obvious interest and importance, has never been written before, but it apparently hasn't, and lovers of the ballet are lucky that it is Homans—herself a former dancer and the dance critic for The New Republic--who took up the task." "A magisterial and often moving history of the silent art…The author artfully choreographs a huge, sometimes unruly cast, producing a work of elegance, emotion and enduring importance." "Homans brings her intimate experience as a dancer and her discerning dance critic’s eye to her fascinating and exquisitely detailed history of ballet, an art that combines rigor and idealism…. [a] glorious landmark study of ballet’s ideals and enchantment." "An important and original work of cultural history…Her cultural critique, as well as her expansive and penetrating view of ballet’s history, recommend this book to all readers who care about the history of the arts as well as their present and possible future." 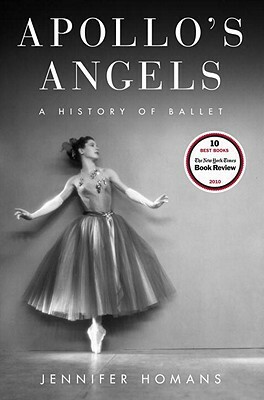 "Apollo's Angels" is an important addition to the literature on ballet: intellectually rigorous, beautifully written, brilliantly structured… an illuminating history much needed now."